- Gloria J. Katch on 七月 25, 2016. It’s time to jazz it up! From July 29th to July 31st, the third annual TD Niagara Jazz Festival will be featuring about 40 different musical acts at about 15 different venues across Niagara with headliners, orchestral jazz instrumentalists, Manteca and Liberty Silver. The highlighting event on July 29th at the First Ontario Performing Arts Centre in St. Catharines will feature Manteca, and Canada’s renowned, Dave Restivo Trio, Cinnamon Jones, Alex Pangman and Alistair Robertson, who will serve up a good cross-section of the various styles of jazz and jazz gems this festival has to offer. “The TD Niagara Jazz Festival is a great event for everybody, whether you are a seasoned fan of jazz or brand new to the genre,” said Juliet Dunn, executive director and co-creator of the festival. Dunn is the quintessential organizer as she is also a performer and jazz connoisseur dedicated to educating listeners on the jazz genre. Many of the jazz bands today have become hybrids of other styles, there are soulful jazz, blues-jazz, classical jazz, vintage jazz and jazz-funk just to categorize the many colors and shades of jazz. 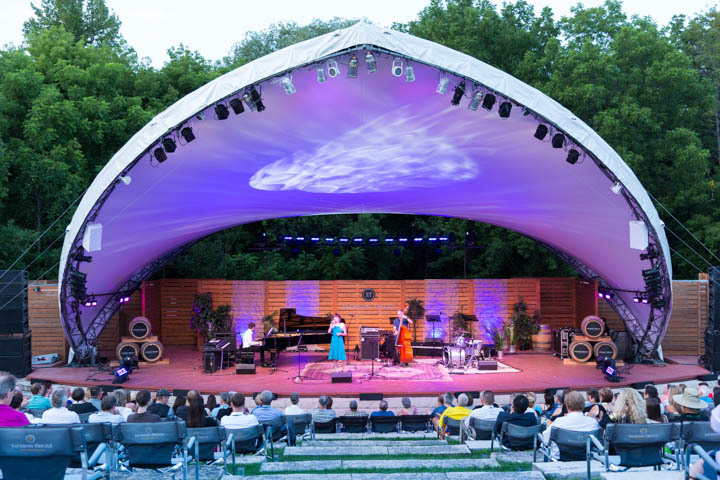 Audiences will be able to enjoy this musical garden in various settings including Simcoe Park in Niagara-on-the-Lake and several local wineries. Manteca is almost a mainstay in Niagara, having performed at Brock University several times and at last year’s PanAm Arts Festival, as well as acting as a mentor to many music students at Laura Secord Secondary School. “With amazing wines and extraordinary people, Niagara is one of our favourite places to play,” says Matt Zimbel, bandleader and co-founder of Manteca. This Canadian treasure will be performing fresh excerpts from its 12th recording, which will be released in the fall. National Jazz Awards’ Keyboardist of the Year and Juno Award Winner, Dave Restivo will also share the spotlight with several of his more recent compositions from the Modica Music release: The Waves. Restivo, who is a teacher at Humber College, is known for his work with artists Rob McConnell and the Boss Brass, and has recorded with Mel Torme, Jon Hendricks, and Dave Holland among others. The jazz festival holds several educational concerts and demonstrations of jazz given by notable musicians, like celebrated jazz pianist, John Sherwood, leading up to the main event, each year. Sherwood is delivering a historical audio tour on piano styles beginning with Joplin and James P. Johnson, then moving onto the left-hand stride and boogie patterns known in blues. He will also include the altered notes that are now common in jazz and right-hand improvisation. Sherwood’s musical tour will be performed on a beautiful Steinway Spirio Grand Piano, which is reported to have an amazing sound, at the Stratus Winery in Niagara-on-the-Lake, July 27th. There is also a “Jazz for The Ages Contest,” which encourages youths and teenagers to develop their jazz and improvisation talents. The winner of this contest will perform in Simcoe Park on July 30th, along with John Sherwood, Barb Mantini Zach Preston, Worst Pop Band Ever, Colin Hunter and the Joe Sealy Quartet among others. There are various packages throughout the weekend like the Sultans of String and the Doug Mundy Trio at the Stratus Winery on July 31st. Soul Jazz includes Liberty Silver and Cinnamon Jones at the Southbrook Vineyards on July 30th. For those who prefer to put a snap in their step, the Jazz Bugs, the Vintage Jazz Trio, and Jumpin’ Jive Duo promise to fill the dance floor. Many enthusiasts are attracted to jazz because of the prominence of the horn section, and the Heavyweights Brass Band at the Oast House Brewers will be a fun gig to join in on July 31st. For more information on the TD Niagara Jazz Festival 2016, please visit the website at: niagarajazzfestival.com for tickets, specific times and locations. Dinner and show packages are also available. There are no sour grapes or sour notes here, Dunn invites everyone to taste the jazz and enjoy the sounds of summer.